Paul was very insistent for a while that my Oldton is now Oulton in Suffolk, as mentioned in Sebald's 'Rings of Saturn'. To drive home his theory Paul dug out a gravestone in the Oulton cemetry marked WRIGHT, and a bell ringing notice that may or may not be some form of encoded message. It so happens my father's ashes were scattered at sea off the coast at Lowestoft, very near Oulton. In his sailing log book from his youth he even mentions Oulton Broad. I told Paul that my dad was an alcoholic who loved sailing. 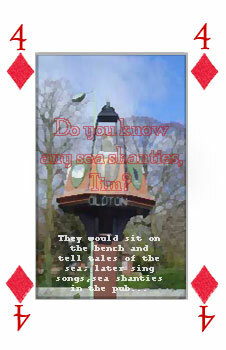 The only sea shanty I know is 'What shall we do with the drunken sailor? '.